This summer Door No. 3 Print Studio and paper cut artist Hannah Viano teamed up to produce a limited edition print for the Methow Headwaters Campaign. This project spearheaded by Methow Headwaters is part of a larger effort to raise awareness to the environmental threat of a large-scale copper mine potentially located at the headwaters of the Methow River. Paper cut artist Hannah Viano (hannahviano.com) created the image for the campaign poster, generously donating the artwork’s use for the project. Hannah’s work draws from a strong sense of place and appreciation for the natural world. The importance of clean water to a healthy ecosystem compelled her to support the campaign and its mission. The limited edition prints were made at Door No. 3 Print Studio in Twisp, printed on the studio’s 1911 Chandler & Price letterpress. Printers Robin Doggett and Laura Gunnip hope the prints will remind people of the land and waterways that make the Methow Valley a place worth protecting. 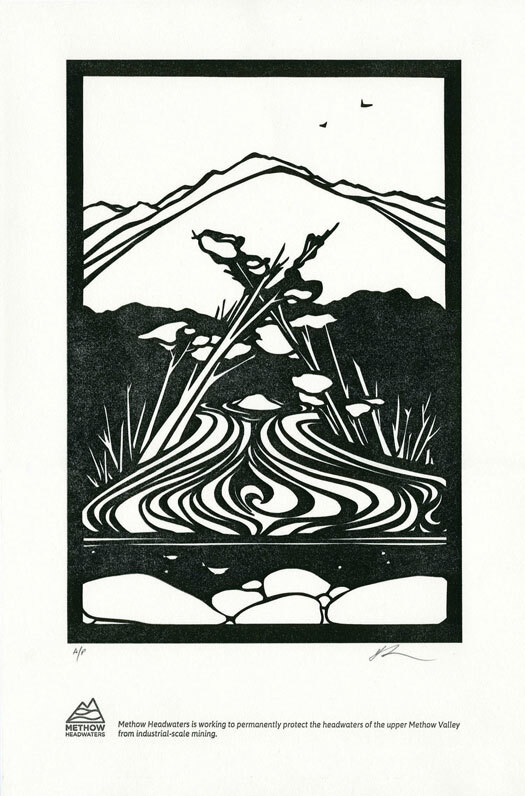 Visit methowheadwaters.org to pledge your support, learn more about the campaign, or request information about purchasing a print.